1) Dip it in your yogurt and eat it (a favorite of my kids). 2) Feed it to your chickens. 3) Feed it to the birds. 6) Make homemade bread crumbs. 9) Make Ham or Sausage and Cheese Souffle. 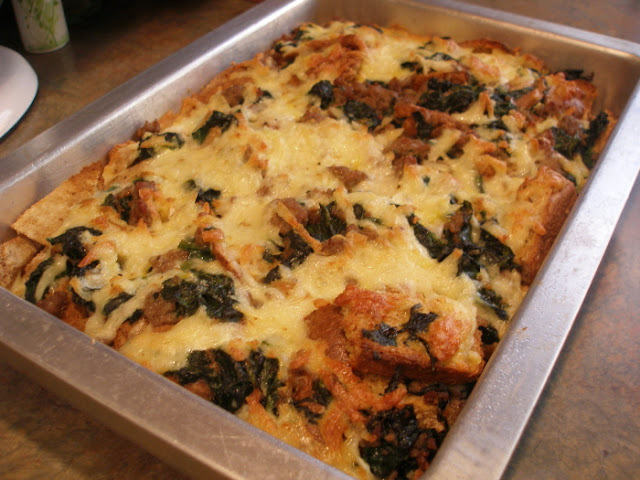 10) Make Spinach (or Chard) and Cheese Strata. 11) Make Savory Tomato Bread Pudding. 13) Buck up and eat it. 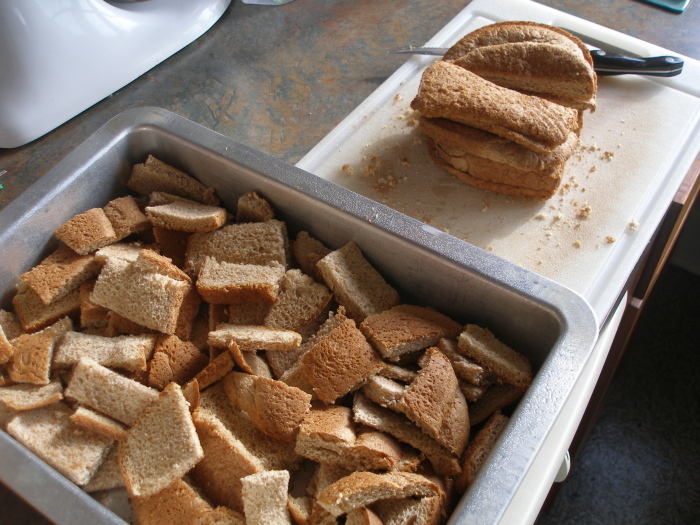 What do you do with bread crusts? A variation of 8, 9 and 10 with sausage, spinach and swiss cheese. My husband loves them. He uses them as an excuse to slather on a little more butter than he normally would! I thought all of your suggestions were great! I use them for bread crumbs. We always need bread crumbs for some reason. Sigh...I wish my family liked strata type dishes as much as I do. That looks delicious! Wow those all sound great but we NEVER have any crusts left... in fact we usually don't have enough crusts to go around!! Those are great ideas. I just eat it. Make a terrific cheeseburger casserole! In a 9 by 13, layer: bread cubes, fried ground-beef (w onion and s and p), chopped pickle and celery, grated cheese, squirts of ketchup and mustard, and top with more bread cubes. Mix together 2 eggs and 3/4 c milk and pour over all. Bake at 350 for 1/2 hour. You can really put anything into these layers, depending on what you like. I always keep a bag of odd bread pieces going in the freezer until I have about 10 slices' worth, for this recipe. Thanks for sharing your ideas, too. Gotta try some of those.